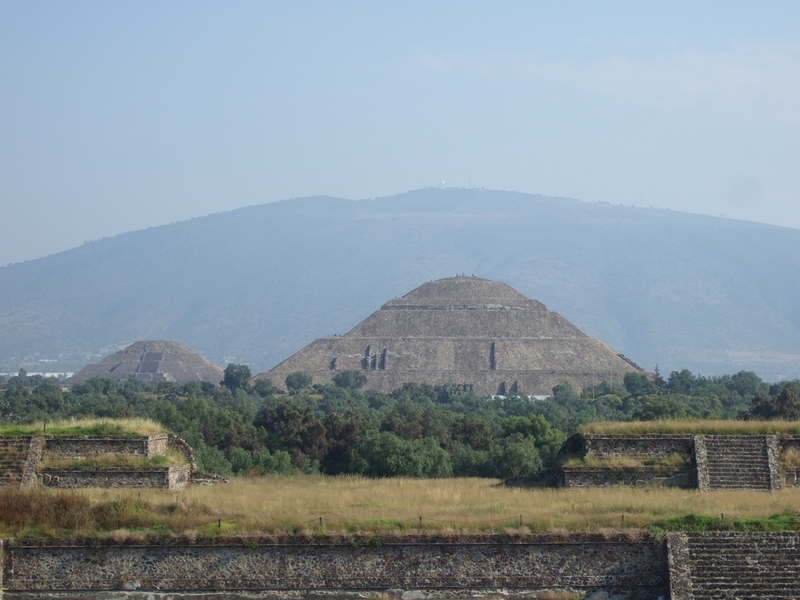 Teotihuacan: Central Mexico Empire With Wide Influence into Maya Regions. Palace of Quetzalpapalotl, and ponder the vibrant murals and fine obsidian tools made by ancient artists and craftsmen. The site covers 32 square miles and was designated a UNESCO World Heritage site in 1987. The original name of the city is unknown. The Aztecs who came nearly 1,000 years later named it the Nahuatl word Teotihuacan, “place where gods were born.” They believed the gods created the universe at that location. The Classic Maya wrote its name in hieroglyphic texts, calling it puh,”Place of Reeds.” Such places were considered the locus of creation, which took place in swampy, reedy, and watery locations. These creation locations are also referred to as Tollan or Tula. Rich soils from swamps supported agriculture, and early settlers constructed raised beds called chinampas. The advanced culture that created Teotihuacan did not leave any writings in the strict sense. They used signs or symbols; 229 have been cataloged but their meanings are mostly unknown. Our understanding of their civilization comes from study of buildings and pottery, placed in context of what is known of regional settlements. Around 500 BCE several urban centers arose in central Mexico. The most prominent was Cuicuilco, with a population of 20,000 located on the south shore of Lake Texcoco. A volcano called Xitle erupted around 400-200 BCE and covered this city in ashes, prompting mass emigration toward the north valley. Researchers think that other peoples joined this migration from 13 small regional villages. There was a huge eruption of the volcano Popocatepetl in 200-1 BCE, forcing survivors in the Amecameca-Chalco-Xochimilco regions to migrate. Maybe Teotihuacan leaders capitalized on the Volcano Gods’ sparing their area of the valley to entice more settlers. 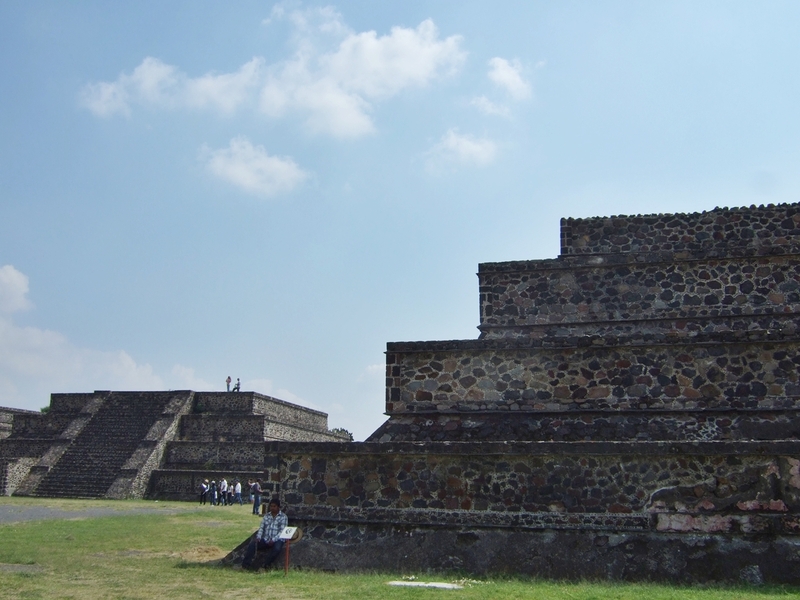 The earliest buildings at Teotihuacan date to around 200 BCE, and the Pyramid of the Sun was completed by 100 CE. Teotihuacan expert George Cowgill reports that “the people who first built and occupied Teotihuacan were simply some of the people whose ancestors had already lived for millennia in Mesoamerica.” (Cowgill, Ancient Teotihuacan: Early Urbanism in Central Mexico, 2015) He believes that asking who were the Teotihuacanos is a false issue; the better questions involve why and how the city and the state it ruled flourished so long, looking at its sociopolitical system, religion and ideology, environmental factors, and commercial enterprises. Teotihuacan built on the urban tradition already developed at Cuicuilco, stretching back to 500 BCE with Monte Alban in Oaxaca. sacrifice. 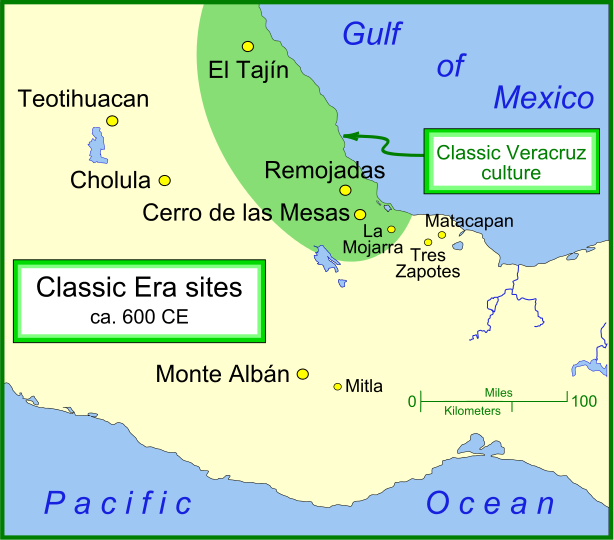 They reached beyond the Basin of Mexico seeking resources, with outposts 124 miles to the west, and by 200 CE Teotihuacan had presences as far away as Pacific coastal Guatemala. 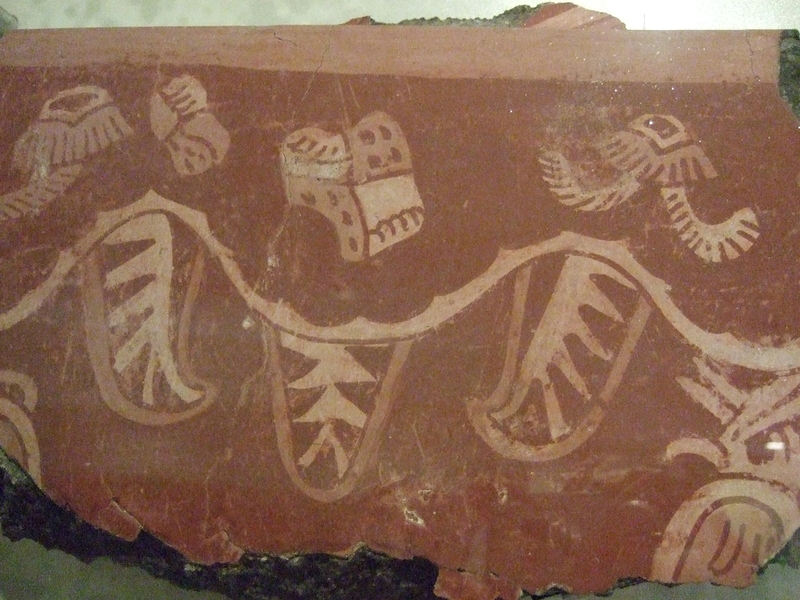 Their tendrils reached far south to Maya preclassic sites such as Kaminaljuyu and Abak Takalik. Around 250 CE a burial in Altun Ha, Belize held 243 pieces of green obsidian from Teotihuacan’s mines in Pachuca. Altun Ha was a large-scale center for jade carving, obtained from mines in the Motugua Valley in southeastern Guatemala. Teotihuacan coveted jade and such elite trade goods underlay the empire’s expansion. This spurred greater incursion into Maya regions. Just over 100 years later, in 378 CE, a group from Teotihuacan changed Maya history in the Peten region. 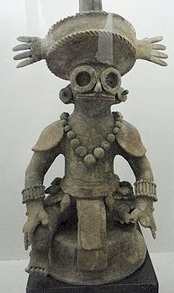 A warlord named Siyaj K’ak (Fire is Born, Smoking Frog) led his warriors to overcome Maya cities of Uaxactun and El Peru. From there his warriors entered Tikal, a venerable city and major power, and the death of Tikal’s ruler Chak Tok Ich’aak on that same day was recorded. The next ruler was Yax Nuun Ayin, the son of a Teotihuacan lord or ruler called Spearthrower Owl (translated in Mayan as Jatz’om Kuh). It is thought Yax Nuun Ayin married into the local Tikal dynasty, perhaps a royal woman named Une Balam who may have been the Tikal ruler’s daughter. (Janice Van Cleve, “Who Was Queen Une Balam?”) Tikal Stela 31 records these events; shortly afterwards Teotihuacan imagery and building styles such as talud-tablero architecture appeared in Tikal. Teotihuacan battle dress wearing the “goggle-eye” mask typical for the god Tlaloc. He was buried in a rich grave inside Temple 16, and his image has first position in the carvings on Altar Q showing 16 rulers of Copan. His descendants attributed Teotihuacano heritage to their founding ruler. Yax K’uk Mo’ possibly accompanied Siyaj K’ak in the earlier invasion of Tikal as a youth, and continued to spread Teotihuacan’s reach to important jade sources in the Motagua River region. He installed a vassal who had traveled with him, named Tok Casper, at nearby Quirigua. Both these settlements lie on the river network leading from the Motagua Valley to the Caribbean Sea. This gave links for Teotihuacan to control the jade trade. 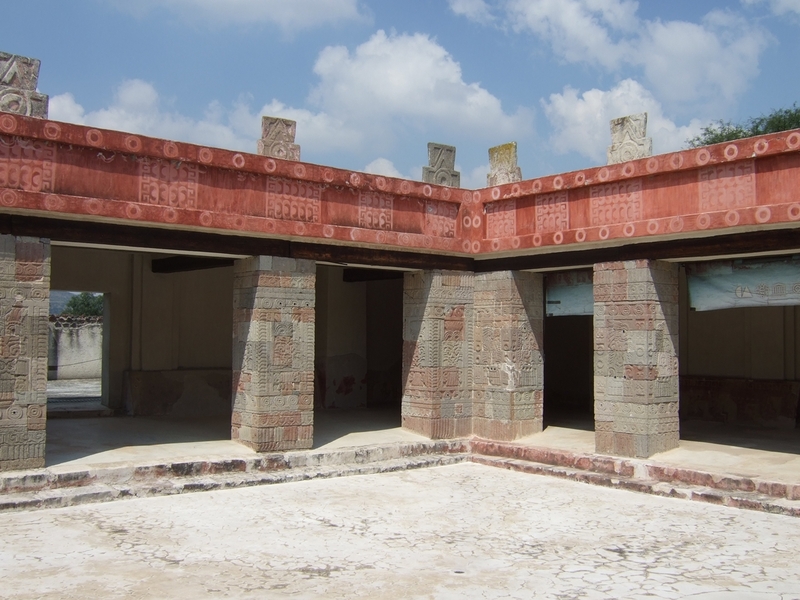 Variants of the Teotihuacan talud-tablero building style are found in Tikal, Kaminaljuyu, Copan, Becan, and Oxkintok, especially in the Peten Basin and central Guatemala highlands. Reasons for Teotihuacan’s success appear to be built into their sociopolitical and religious systems. Some experts think they offered a new, attractive world view that blended religion and government in a unique way. The extensive urban planning and awe-inspiring monuments still observable today provide testimony to this well formed civic-spiritual ideal. 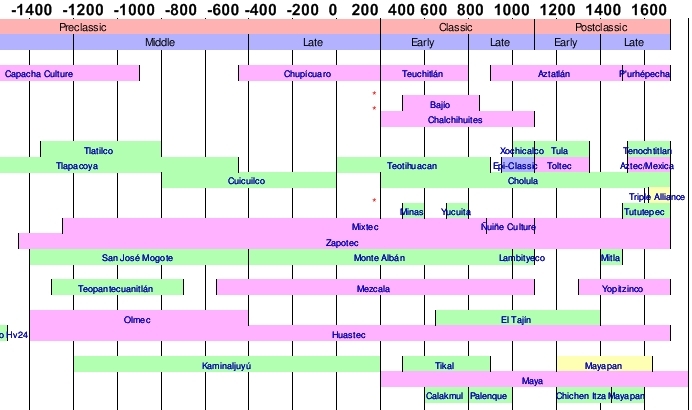 The Teotihuacano fusion of extreme religious rituals that included human sacrifice, formalized social structure, and astute political organization formed a powerful matrix that controlled the lives of all who lived within it, and many in distant locales. How closely the ruling elite administered outposts is debated; more likely their agents influenced trade arrangements and local dynastic politics. 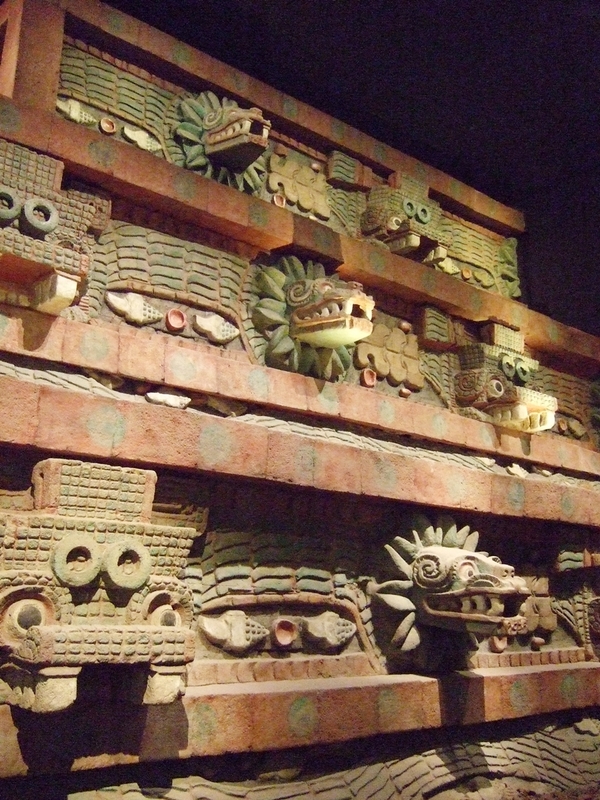 Cultural diffusion led to adoption of Teotihuacan styles and traits to emulate the powerful empire. The enigmatic leaders of Teotihuacan appear by the mid-500s to hold sway over much of Mesoamerica. They mainly accomplished this through political alliances and vassal rulers. By controlling trade networks, they kept the Teotihucano people well fed and living in comparative luxury in an advanced city with running water, sewers, brick homes, neighborhood communities, and multi-level residences. Public rituals with human sacrifice that played out before thousands of viewers maintained priesthood and elite power. Eventually the system did fail by 650 CE. As with collapse of other major civilizations, a number of factors were involved. Perhaps most insidious was internal competition between priests, elites, and leaders. Resources were siphoned off from central government, weakening the discipline and social control systems. A series of long droughts occurred around 535-536 CE, with evidence of famine and malnutrition. It is possible the eruption of the Ilopango volcano in El Salvador in 535 CE created climate changes. There was increased warfare and internal unrest. Popular rebellion led to burning elite dwellings and major civic structures along the Avenue of the Dead. Sculptures inside palaces were shattered. 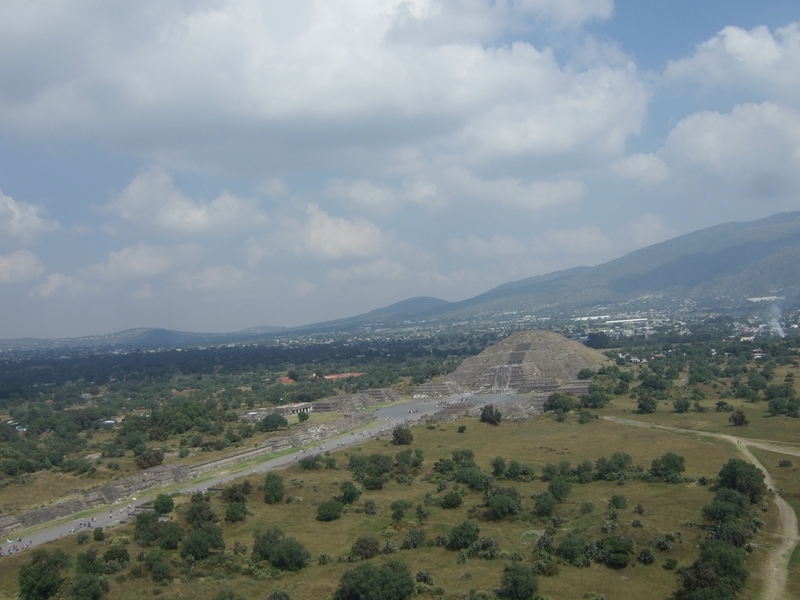 Population declined to 20,000 and Teotihuacan’s power diminished. Many of the elite may have fled the city, going on to create new cultural centers to the south. Other nearby centers such as Cholula, Xochicalco, and Cacaxtla competed to fill the power void. This led to rise of the Totonac, Toltec, and later Aztec peoples. 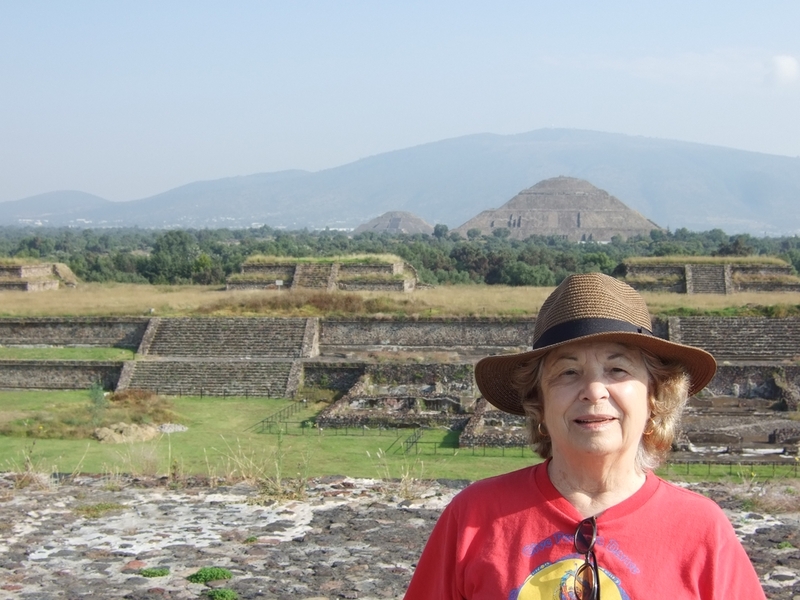 In October 2018 I visited Teotihuacan for the first time–it was on my bucket list! I went with archeologist Edwin Barnhart on his Maya Exploration Center tour of Basin of Mexico sites. No better way to experience and learn about ancient Mesoamerican cultures. Visit Maya Exploration Center for more information. Dr. Barnhart also made a video lecture series for Great Courses on Maya to Aztec: Ancient Mesoamerica Revealed. George Cowgill. Ancient Teotihuacan: Early Urbanism in Central Mexico. Cambridge University Press, 2015. Edwin Barnhart. Maya to Aztec: Ancient Mesoamerica Revealed. The Great Courses, 2017. Simon Martin & Nikolai Grube. Chronicles of the Maya Kings and Queens. Thames & Hudson, 2000. David Stuart. “The Arrival of Strangers.” Teotihuacan and Tollan in Classic Maya History. PARI Online Publications, Newsletter #25, July 1998.